Explore the history of Rajasthan and admire the architecture of its ancient royal palaces in India’s Golden Triangle. Step into glorious, historic, royal palaces to experience the royal lifestyle. Be awed by the magnificent hilltop Mehrangrarh Fort and Amber Fort overlooking the cities below. And admire the royal tombs of Taj Mahal and Humayan’s tomb. Then be pampered at heritage hotels for a memorable old world experience. 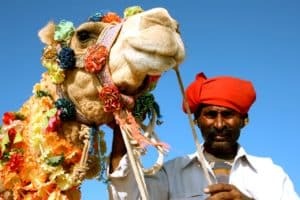 Ride a camel through the golden sands of the vast Thar Desert in Rajasthan on your Camel Safari then enjoy the bliss on the stunning lakes. This 13-day tour is a golden treat for all! Let’s tour Humayun’s Tomb - one of the best preserved Mughal monuments and best example of Mughal architecture in India, Qutab Minar - the world’s tallest brick tower, and Jama Masjid - India’s oldest and largest mosque. As we travel through both Old and New Delhi, don’t forget to add photographs of Rashtrapati Bhavan (President House), Parliament House and India Gate to your album. Experience a busy & bustling local bazaar with a cycle rickshaw through Chandni Chowk. Followed by our group Namaste dinner. Departing Delhi, we make our way to Agra, the erstwhile capital of the Mughal Empire. Our first stop here is the impressive Agra Fort, which boasts some of India's finest Mughal buildings behind its fortified walls. This is our chance to size up the Itimad-ud-Daulah Tomb that is a Mughal era mausoleum, often described as a "jewel box" or the "Baby Tāj". This tomb has often been regarded as the inspiration for the Tāj Mahal. Later we visit the legendary Taj Mahal. Built by Emperor Shah Jahan in loving memory of his beloved wife Mumtaz, who tragically died in childbirth in 1631. The Taj Mahal is described as the most extravagant monument ever built for love and remains one of India’s most enduring symbols. Another must-see, we will view the Taj Mahal from the lesser known, and less crowded, Mehtab Bagh (Moonlight Garden) just across the river. Experience a breathtaking photo-op with a fully symmetrical view of the Taj Mahal! En route to Jaipur we visit the ghostly former Mughal city of Fatehpur Sikri, which has been deserted for over four centuries after it was allegedly abandoned due to a lack of water. Thanks to the very durable red sandstone from which it was built, Fatehpur Sikri remains well-preserved and a fascinating place to explore. We will have a quick photo-op stop at Keoladeo Ghana National Park, a UNESCO World Heritage Site. Keoladeo is a bird sanctuary that attracts many species of birds from India, Afghanistan, Turkmenistan, Siberia, China and Tibet. The park is also home to deer, antelope and boar, which can be readily spotted. Who in our group will be the champion ‘shooter’? And then to Hawa Mahal, a palace so named because it was essentially a high screen wall built so the women of the royal household could observe street festivals while remaining unseen from the outside. Later we visit a cotton weaving house for a demonstration of fabric dyeing and block printing before touring the City Palace and Jantar Mantar. Later we drive to Jaipur, the bustling capital of the state of Rajasthan. We travel to the stunning 16th century Amber Fort - a sprawling Rajput construction, perched on a hillside overlooking the dusty plains below, regal palaces, sleepy villages, and stone carved temples. Reaching its summit on a jeep, we enjoy a tour of the fort's well-preserved interior grounds. Continue to Sheesh Mahal, "Palace of Mirrors" which takes its name from the reflective glass tiles that embellish the interior. On our way, enjoy the sight of Jal Mahal (Water Palace), a palace located in the middle of the Man Sagar Lake. City Palace is an imposing blend of traditional Rajput and Mughal architecture. It is a vast palace complex occupying nearly one-seventh of the Pink City. It was originally built by Maharaja Jai Singh II. The complex is divided into a series of courtyards, sprawling gardens and buildings. It is home to several palatial structures like the Chandra Mahal, (home to present Maharajah of Jaipur), Mubarak Mahal (housing a textile museum), Diwan-e-Khas (or Hall of Private audience housing the two largest silver vessels in the world), the Diwan-e-Aam ( or Hall of Public Audience) and the gateway Ridhi Sidhi Pol (with four small doorways decorated with motifs depicting the four seasons). We spend the evening at Chokhi Dhani (a Rajasthani cultural village) to enjoy traditional performances of dancers & acrobats, snack stalls, paintings, costumes and tasty Rajasthani thali cuisine at this Rajasthani cultural village. In Pushkar you can witness the serious business of livestock trading. There are also plenty of market stalls with local wares on sale, including bracelets, clothing, and fabrics. According to legend, three petals from the lotus flower weapon of the Hindu god Brahma fell to the ground and each became a lake, one of which was Pushkar Lake. On the day of a full moon during the lunar month of Kartik thousands of pilgrims flock to the Ghats of the lake to bathe in its sacred waters. Our sightseeing today includes Pushkar Lake and Brahma Temple. Explore the golden sands of the vast Thar Desert in Rajasthan on your Camel Safari, a once in a lifetime adventure! The Aravalli Range has sandy fields, small dunes and beautiful hills with mesmerizing sunrises and sunsets. Being on the edge of the Thar Desert (or Great Indian Desert) Jodhpur is called the Gateway to Thar. Jodhpur is a historic city dating to 1459 AD when it was founded by Rao Jodha, the Rajput chieftain of the Rathores. The Rathore kingdom was also known as the Marwar and was the largest in Rajputana. The city was built as the new capital of the state of Marwar to replace the ancient capital Mandore, the ruins of which can still be seen near what is now the Mandore Gardens. Jodhpur is also known as the Blue City with many houses in the old city in shades of blue. Visit Mehrangarh Fort, which was described by Rudyard Kipling as "the creation of angels, fairies and giants." Explore the old city on tuk-tuks as you pass by local artists, puppet makers and traditional spice markets. Savor rustic Rajasthani life on a village safari to Bishnoi. Spot black bucks, chinkaras (gazelles) and migratory birds that are often seen in the countryside. Enroute to the charming village of Deogarh. Deogarh Mahal perches on top of the Aravalli Hills. This romantic fortified palace impresses with its marvelous central courtyard and its array of battlements, domes, turrets, jharokhas (a type of overhanging enclosed balcony used in Rajasthan architecture) and huge gateways. It was restored and converted into an authentic heritage hotel. Ranakpur Temple forms one of the five major pilgrimages of the Jains. The temple was built in the 15th century on the western side of the Aravalli Range. This temple is constructed of light colored marble with a basement covering an area of 48,000 sq feet. There are more than 1,400 exquisitely carved pillars that support the temple. The complex consists of Chaumukha temple, Parsavanath temple, Amba Mata Temple and Surya Temple. Explore the intricate mosaic of rural and Royal Deogarh in her colorful villages and understand the ancient bonding of the feudal lords with their subjects. Unravel the treasures and view the private Vintage Car Collection with one of the members of the feudal family (subject to availability) followed by a village walk. Catch a glimpse of the humble surroundings and ancient traditions and customs. Today drive to Lake City of Udaipur that is an oasis in the desert of Rajasthan. Udaipur is surrounded by the Aravalli Hills and dotted with palaces. Pichola is the name of a village that was submerged and lent its name to the expanded lake, Lake Pichola. Lake Pichola hosts two islands, each with a palace: Jag Mandir (Lake Garden Palace) dating from 1620 as a summer resort and pleasure palace for the royal family, and Jag Niwas (or Lake Palace), an eighteenth-century granite and marble palace which was a residence for the Maharaja´s guests. The famous Lake Palace, located in the middle of Lake Pichola is easily one of the most beautiful sights of Udaipur. It is now a hotel with walls made of black and white marble and adorned with semi-precious stones and ornamented niches. Gardens, fountains, pillared terraces and columns line its courtyards. Along the eastern banks of the lake lies the City Palace. Surmounted by balconies, towers and cupolas towering over the Lake Pichola, the imposing 16th century City Palace is Rajasthan’s largest palace. Inside Badi Pol (northern entrance), eight arches on the left commemorate the eight occasions maharanas were weighed here and their weight in gold or silver distributed to the lucky locals. You then pass through the triple-arched Tripolia Gate into a large courtyard, Manek Chowk. Spot the large tiger-catching cage, which worked rather like an oversized mousetrap, and the smaller one for leopards. The Mor Chowk (Peacock square) - the elaborate design of this chamber consists of three peacocks (highlights the three seasons of summer, winter and monsoon) constructed by Sajjan Singh in the 19th century. A total of 5,000 pieces of mosaic of green, blue crystal and gold, as well as concave mirrors evoke the elegant movements of the birds that are the symbol of the Rajasthan. Visit an art gallery dedicated to modern, contemporary and traditional art. After breakfast, we depart to Udaipur airport and fly to Delhi or Mumbai International airport. The tour comes to an end. To provide an ample buffer, you are advised to schedule your international flight home to depart at 6 pm (or later) from Delhi or Mumbai. ** Price per person, based on triple occupancy. Solo traveler or larger groups, call for price.